Would like to break your knees? Bump badump badump badump baDUMP!! That's maaade for you and meeee? "C" is for "copyright violation!" Ted, Shelly, Dana C., Amanda L., Colleen B., Stephanie, Jennifer D., & Dana C., I think the creepy tongue adds character. *Badumpbum* And in all fairness, that last one could be a really, really bad Princess Leia cake. That green one is SO trippy. Anybody else notice that the first one says, "Happy Birthday and Chris"? Is that "We hope that birthday is happy, and Chris is happy also?" or is it an abbreviation for "Happy Birthday and Christmas?" Strong Achewood vibes in this batch! i love how the first one says "Happy Birthday and Chriss" WTF? The third one kinda looks like Felix the Cat wearing Mickey ears. That last one looks like it's from "The Planet of the Apes!" Just wondering when ears started growing out of cheeks...? My two year old recognized Mickey in there somewhere. I guess it's because these cakes were decorated by two year olds. On that first one, "Happy Birthday AND Chriss"? "...and this is Mickey after he ate too many carrots..."
The CCC is the best-looking one of the lot. That in itself sends a message. 1. Mickey Mouse as seen by Don Martin. When all the kids are awake, we're gonna see a bunch of comments saying, "My 4 year old told me, 'That's a mean Mickey!'" Noooo! Not Mickey Mouse! *sobs* I know it was only a matter of time but...whyyyyyy??? P.S. That last one looks like the lovechild of Mickey Mouse and Joan Rivers *shudder* Thanks for the nightmare fuel, wreckerators. Not that it makes a difference, but why is the green one upside down? And why oh why oh why the ruby red lips on the next one? That one is just sooo wrong. WV: belyi - those pics give me a belyi ache. I quite like how the second one has 'WOW' written above it, like the decorator can't quite believe what just happened. The last one is Princess Leia meets Wolverine. Is it just me or does the third one have a Margarita candle on it? I guess you have to be drinking to appreciate the "artistic" value of the cake? I think you're mistaken on the first one... I think it might be a Jay Leno CCC. Third one...why is he wearing an earring? First one...was supposed to say "Happy Birthday and Chriss....mas? Chriss....ening? Chriss....ake why did you make me do a CCC?" WV: suckerci....Jane was such a suckerci actually paid for a Mickey Mouse wreck. That last Mickey Mouse looks like Michael Jackson after all his plastic surgery. Frightening! I thought the last one was a combination Elvis/Mickey. You know, in case you'd ever need a cake like that. 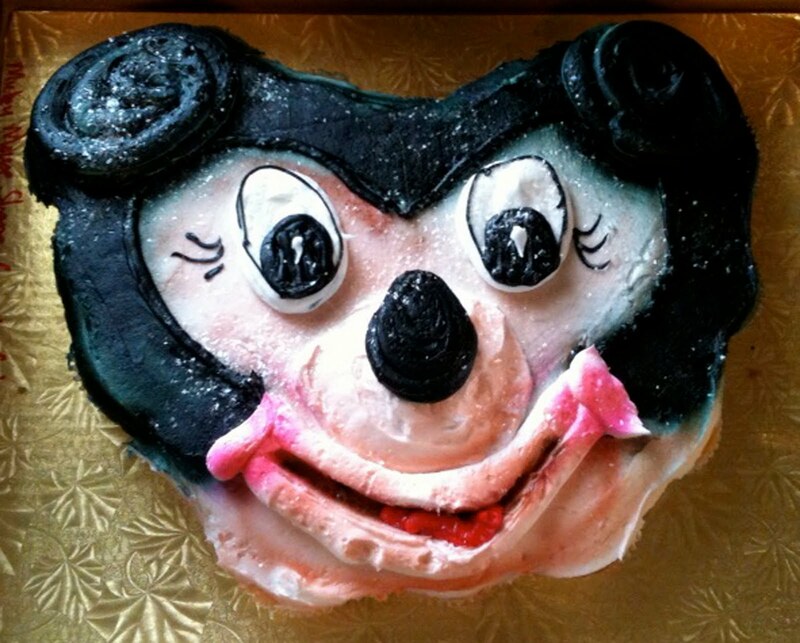 I mean, it's OBVIOUS that cake is supposed to be Minnie, not Mickey. I mean, it has EYELASHES! And BLUSH! And DANDRUFF! Can it BE any more feminine?! Poor Mickey. I don't think he ever did anything to deserve this kind of wreckage! They are SO bad and SO unappetizing that I don't think I could even eat any of them. I've been a fan forever, never commented, but your lyrics to the song are beyond win. Jen for poet laureate!!! Why does the green Mickey have blank eyes and look like it's been photographed on the ceiling? Are you trying to make me queasy? It's working! This made me laugh out loud this morning! Thanks! I can't remember when I last laughed so very much and so very loudly. Thank you from the bottom of my heart for this post! Just to be picky, I'd say the fourth one was actually Mighty Mouse. Not that he's orange either. UGH! What is wrong with people? Uh, looks like some of those wrecks are of Mighty Mouse not Mickey Mouse. Yeah... right... not that it makes them any better. wv: spsyc "Could you be more spsyc with what you want on your cake?" Does anyone see the little margarita or lime earring that the third one is wearing??? ha my word verification is COLON!! As these cakes are bad for my colon! Wow.. the green, hazardous waste Mickey is totally defying gravity. That last one was a combination of Elvis, MM and Princess Leia! There was almost an incident with my oatmeal when I got to that second cake. wow- That was so funny. laughed out loud and that is hard to get me to do- despite my name. I think the third one is supposed to be Tom from Tom and Jerry. At least the colors are correct. Glad I'm not the only one wondering why the first cake say "Happy Birthday and Chriss?" I especially like the "WOW" on the knee-breaking Mickey. Couldn't have said it better myself. I think that last one is actually Michael Jackson. Gosh, that second one looks more like an angry bear than the beloved Disney character. Notice it says "WOW" at the top? Wow, indeed. That last one is just plain scary. Bet the birthday kid ran screaming from that one. Honestly, at first glance I thought the second one said, "Happy Buttholey". Yeah. I see birthday now but try looking at the screen but not directly at the word. I would like to apologize for my last comment. Of course he didn't get rabies. (Referring to the last cake.) Upon taking another look, I've come to realize that he must be getting on in years, and here we all are making fun of his appearance. This is just what happens when you age in Hollywood...it's not pretty without all the airbrushing, (or paint-brushing) but he's still a beloved icon. I didn't mean no disrespect Mickey, please don't send the second cake after me! 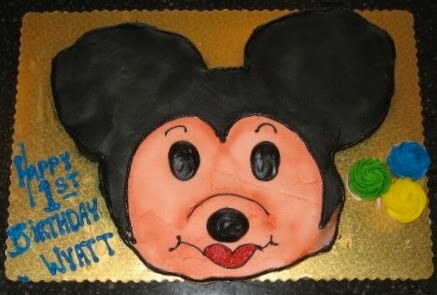 Proof that nothing is sacred when it comes to decorating cakes (or trying to)... Walt Disney would be horrified. That's not Micky in the green cake, I'm afraid. Those are tumors growing out of a misc. cartoon character. I, too, thought that the third cake was Tom, from Tom & Jerry, not a very good Tom, but Tom none-the-less. Who would make rounded cat ears? my four-year-old tootsie said "that one kinda looks like MRS Mickey, but really they are all terrible." I am a total Disney-phile... I went to Walt Disney World on my honeymoon... I even have a D23 membership... and now, my heart hurts. I thought there'd be a Donald Duck wreck after the Mickey Loompa. Just to fit in with the song. Wow. Too bad THESE Mickey's aren't hidden. My 4 year old daughter was looking at this post with me. She saw the green one and exclaimed, "Cactuses???" Maybe the green one is Mickey Mouse by way of Pablo Picasso. Wow, the green one is just wrong. There's a cyst on your cheek, Mickey. Better get that looked at. WV: undwato. I wish these cakes were several fathoms undwato. Yeah, so not only is the first one totally misshapen, but what's with the greeting? "Happy Birthday and Chriss..." and Chriss what? and Chriss don't forget to take out the garbage? I always love the writing on this site, but I think you really outdid yourself on this one. It's perfect! That green one is horrendous and what on earth did they DO to the last one?! These are terrible! The wreckerators should be taken outside and beat! I see Elvis and Princess Leia! Wow these cakes just make me sad. Now is it mt imagination or on that last one did someone think a heart-shaped cake pan would work if you used enough frosting? This has made my day! Knowing that these cakes were made by "professionals". My first attempt, as a complete amatuer baker, with a character cake was a Mickey Mouse cake for my son's 1st birthday. I wasn't thrilled with the results, but it looked a hell of a lot better than these cakes! That last one is what would happen if Elvis and Minnie Mouse ever got it on. Someone mentioned that that second one looks like it says "Happy Buttholey" I saw "Happy Burthelay" . . . either way - WOW is right! :) Scary! I did notice the "Happy Birthday and Chris." Also, if I had to pick a saddest cake, it would be the cookie (I think it's a cookie) because it looks like they actually PAID for that. At least the others were homemade and folks were just trying to please their loved ones. Uncertain if I'm looking at pastry or the photos in a medical journal. Would the jaundiced Mickey be more festive or the vomitous Mickey? "...that last one could be a really, really bad Princess Leia cake." 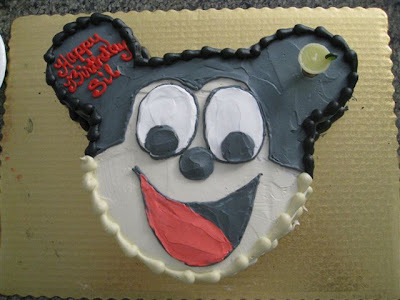 .....OR, a really, really bad Mickey Mouse cake? And, Man! "WOW" is right on for that 2nd one down--it looks more like Yogi Bear. On quaaludes. Green Slime Mickey? Hate to tell them, but trying to *avant garde-up* the photo shoot by somehow hanging the thing off the ceiling (or standing on their head to take the picture) doesn't help matters much. It's still like something you'd see after a rousing stomach-pumping. The only one I'm not worried about is the orange one, because what 1-year-old is going to give a flying **** what it is anyway? The kid'll just wear it and end up looking like an Oompa Loompa anyway. My four year old was looking at these with me - and she did not say "mickey" once! On the second one, is that supposed to be MOM upside down or WDW for Walt Disney World? Has Mickey been expelled from Disney Land for bad behavior? I bet the first one was supposed to say "Aunt Chris" instead of "and Chris." Now I feel totally justified in my dislike and fear of Mickey Mouse. Bakerella has some adorable mickey mouse cake pops up right now. I think the first one is also suffering a misunderstanding. These certainly put the ICK in mICKey. Donald & Pluto are now out hunting them down. First one looks like Jay Leno. . .
Ok, maybe the wreckerator had a "Mickey Finn" before they grabbed the piping tube and started on the green Mickey with the RED nose. There is a Mickey Finn Sour Apple drink that would fit right in with this cake. That last one is totally the love child of Princess Leia and Mickey Mouse. Maybe that sad CCC was supposed to say "Happy Birthday AUNT Chris"
I sang this whole entry aloud to my husband. We rolled. Also, is it just me or does that second cake say "Happy butthiday?" You know what's horrible, is there's already a Mickey Cartoon where Mickey is turned into a monster, and that green wreck doesn't even look like THAT monster Mickey! The worst thing about the green one is that I think I see the edges of three more of them, maybe four. wv: xxjhinc. Have I had too mush to jrink or do these wrecksh really xxjhinc. so what's up with the lime piercing? Wow, just, wow, great commentary on this one Jen, I was stifling lots of giggles at my desk. 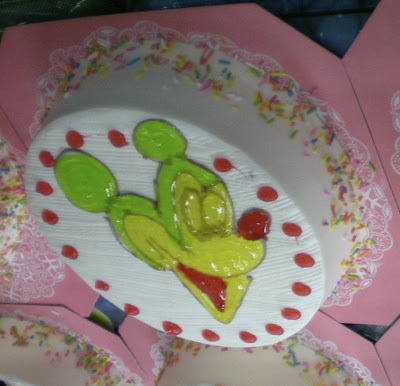 they're all awful, but green mickey is the most appetizing--I think it's an ice cream cake! Someone there just got their Disney characters stewed up a tad. And that's what I get for expecting this S*** to make SENSE. I bet and Chris was so happy when he got his cake!!! As for the last one...is it too soon for Michael Jackson jokes? If not, it looks like he and that strange Mickey shared the same plastic surgeon. Or is this what he had the baker create for a treat at his sleep overs? Ewww. wv: dinaty. Mickey's dinaty deserved better then this. The last one is the love child of Princess Leia and Elvis. Nah. That orange thing is Mighty Mouse. Couldn't say why but I thing Mighty Mouse, not Micky. Despite the plastic critter perched on his ear. I think the last one is actually a Little Richard cake. That first one made me think of Jay Leno's chin. I missed an episode of South Park wherein my Main Mouse Mickey beat the crap out of the Jonas Brothers!??!?! Damn it. That said... Wow. Just... Wow... Mickey gets no respect. Totally called it. See my comment above. mickey's ears should be 85 degrees apart, and they should be 55 degree ellipticals. so there! You know the game where you try to find 'hidden' Mickeys...well I think these needed to STAY hidden. Yeeeeeikes. Well, to be fair, none of these cakes have to deal with copyright violation, since you would have to be able to recognize what was being copied. In addition to the FINE decorating skills, one must commend the photographers who chose to take their photos upside down. I suppose it was necessary, if stealth is required? SO glad I'm a facebook fan! I was having a bad day at work until I saw these and I actually laughed out loud! BTW, I'm making a Mickey cake and cupcakes (NOT a CCC) for a friend's child's b-day. Hope they turn out better than THESE! Makes me realize that I'm more talented than some professionals! That last one has to be Michael Jackson! Note to self, if I ever feel like making a Mickey Mouse ccc, just make a bunch of groups of three. That last one looks like Michael Jackson! Oooh, lobsterjohnson beat me too it--I immediately went to find that Achewood to post when I saw this. I hope none of these caused a baby otter to sob in his bed. My three year old keeps telling me the second to last Mickey Mouse cake "has make-up on it"
I think the client probably said, "Write 'Happy Birthday' and 'Chriss' on it." Who's the maker of this cake that's made for you and me? C-A-K E-S-P O-I-L-E-R. Cake spoiler! Cake spoiler! 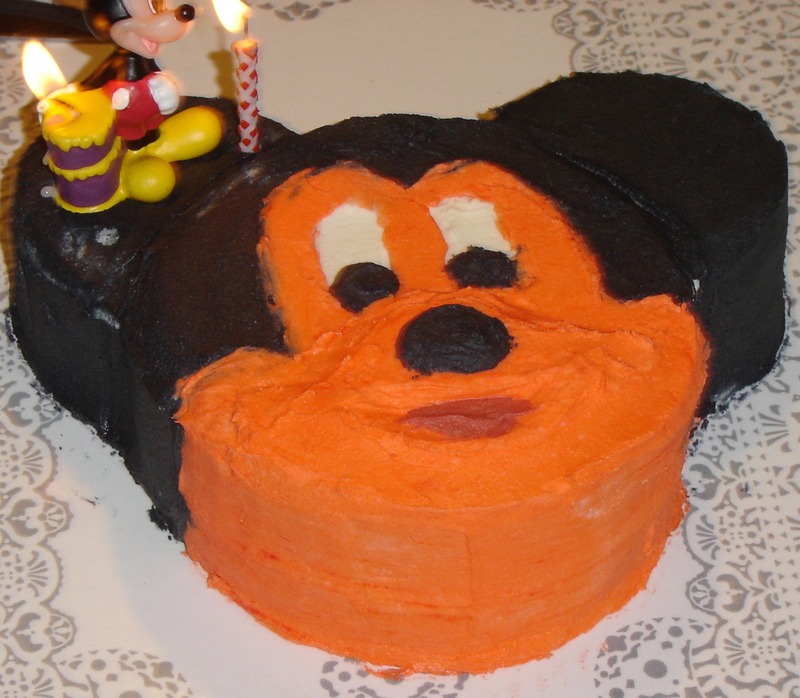 I had a Mickey cake one year for my Birthday. The bakery used a ton of this black gel stuff for his ears and nose. Everybody's teeth turned grey and our lips were black. It made for some very interesting photos! I think that last one is the love child of Princess Leia and Elvis, just saying. Children attempt to identify with these characters. Children attempt to identify with these characters? (in my best Yoda voice) Doomed we are. Thank you for the laugh at work today! I am going to have to stop reading these while the kids are sleeping, as I've woken them up again. K-E-Y- Why, why, WHY??? had me snorting. Wowza - and I just went to Disney's Animal Kingdom when you posted those Mickey Mouse cakes today!? How coincidental! I think the third one was Felix the Cat. Or possibly the offspring of Mickey Mouse and Felix the Cat. Which is a kind of terrifying thought. No wonder I never liked Mickey Mouse! The last one scares me, possibly because it looks like Michael Jackson with Princess Leia hair *shudder*. One of the few occasions it's appropriate to sing the Mickey Mouse March in a minor key. The only other time it would be appropriate is at Mickey's funeral. wv: slynizin. i'm afraid that terrifying CCC is going to try slynizin into my house when i'm asleep. By far my favorite post you've ever writen. So funny. I'm pretty sure that last one is a Michael Jackson death mask . . . you know the old cake tradition. What kind of carcinogen makes icing black? Why would you want to use it? Wow... that was kinda like a rorschach test. The green one? That was "C" is for copywrite violation? I totally saw Goofy instead of Mickey. Go figure. Radioactive mutant Mickey is messing my perception...he's right-side up, but the world is updside-down! Arrrgh! Anyone else notice the last disaster is based on a heart shaped cake? They just can't help themselves, trying to recycle Valentine cakes. Give up! My hat's off to you, John. That parody brings back memories. Sadly -- or fortunately, depending on how you look at it -- the cakes do not. the third one isn't too bad. That was hilarious! Only problem is that I now have the Mickey Mouse Club theme stuck in my head. I thought the last one looked like Elvis impersonating Mickey. Anyone else think that last one looks like Michael Jackson? Howdy. This is by far my favorite foodie site out there. I can't stop laughing! 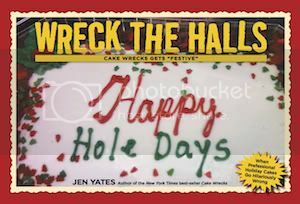 Cake Wrecks is absolutely the best sweet to enjoy. That first one looks like it says happy birthday and Chris.. and Chris what?? Run before this possessed CCC tries to eat you instead?? That poor sick green Mickey. He must have tried to eat that CCC. The last one lol at Princess Leia oooh I can't stop laughing. Those are terrible. I had to scroll through several times, because I kept speeding through, truly, truly the stuff of nightmares. He's not that complicated of a character to draw, pretty darn simple. Why on earth was he green in one??? I'm all for artistic license, but come on. Who was the last one??? Mickey's grandma with two curly buns in her hair or sailor moon mouse??? Andy Panda?? Sure those are supposed to be eyelashes & not crow's feet. Whoever it is they need chap-stick bad!! The Lord of the Flies cake is looking a whole lot friendlier. And what is it with the frosting dandruff??? So I was singing "Who's the one who can't be made into a CCC?" to the theme song, and I inserted a "ptui!" of my own. It fit perfectly. I didn't plan on commenting (I love to lurk in the shadows and laugh like a maniac at your comment, Jen, and your comments, members of We love the Wrecks around the World - or www), but my word verification word is "ulastron", which I think is the name of the sound I made by seeing the last cake, as in "Only dogs can hear that level of ulastron"
Wheeeeeeee! Now I'll have this playing on a loop in my head all day! P.S. whoever came up with the idea of a CCC needs to know what wrongs he has brought upon this world. That last one has an Elvis look to it I think. Sorry if someone already mentioned that. "Mickey can be made into a fantastic CCC, but I won't share that since you all think CCC can never be cute. ;)"
Aw, come on~ be a sport! Somewhere out there the inquiring mind (yes, that's singular) may want to know! And, yes, I just had to sing my way through these wrecks. Thanks for making my day. I'll be honest with you, I've always hated Mickey Mouse in the first place. These just make me laugh so hard. But the last one, damn, that's the stuff of nightmares! Upeps need to learn to decorate better, or you're fired! Oh, my, now those are truly awful and for a Disney fan, painful to look at, but I admit I laughed like a fool as I read the commentary ! Compared to the rest, the first one actually doesn't look that bad! Mickey Mouse #7: Looks like this "Mickey" went to Michael Jackson's plastic surgeon TOO many times! Is it just me or does that last one look a bit like Michael Jackson!?!? My two year old recognized the first as Mickey, the others got a funny look. lmao my 3.5 y/o came in and goes eeew mickey...thats not mickey! Laughing myself to tears doesn't happen much, but I definitely just did. You almost killed me with this post, and I couldn't love you more for it. So Mickey is Princess Leah in real life. Who'd have thought it. The first Mickey looked like he got chin lipo, and orange Mickey is perfect for the gal who loves the tanning beds a little too much. Forgive my ignorance, but what is "CCC?" 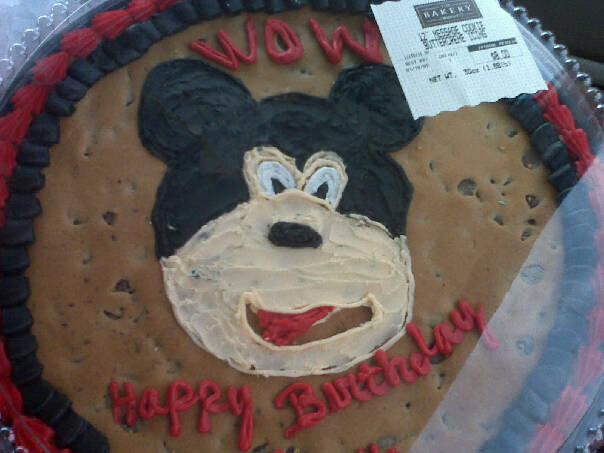 I think the very first Mickey cake was supposed to say "Happy Birthday Aunt Chris", but it says "Happy Birthday and Chris". CUPCAKES CLUMPED TOGETHER=ONE BIG CAKE. Here's how to MAKE one!!!!! 1-Gather up enough individual cupcakes to please whatever size crowd you have hanging around. 2-Arrange said cupcakes in a form that (in theory) represents something *special* (character-like Mickey Mouse), or whatever else you have your sights set on. 4-Decorate the top in such a way as to convey that it is supposed to look like the whatever-it-was you had in mind. That COULD mean adding eyes, nose, mouth,etc.--if it is a face you're shooting for. The possibilites are ENDLESS. You could have YOURS be whatever you want!!! Even in the shape of a map of a United State. Like where you live. That's ALWAYS fun. Yes! Let your imagination run wild. 5-Make sure (!!) to take pictures. 6- Watch for your masterpiece to show up on this. very. blog. Send us a postcard from wherever you moved to to escape the shame and ostracism. NOT that anyone cares, but I meant to say "slather," not "slater." I HAVE my reputation to uphold, after all! This is a riot - I love the lyrics! Princess Leia cake I thought that too!! I almost peed my pants laughing! Omfg! Rofl. Thanks for the laugh!!! Anyone NOT singing along with this? Such a shame that future generations won't have the MMC to reference. The second one could be an evil Yogi Bear too ... right before he goes out to totally mess up that ranger for taking back the picanic baskets! This is what I get for trying to read Cake Wrecks while in class: seriously disruptions by laughing OUT LOUD, while trying to sing the song. If there was anyone to blame for my inevitable F, it's now Mickey. "Panda, bear, cat, orange thing, that green one's a mickey mouse, mickey, cat, look at that thing - I think it's a cat." Anyone else think that last one might not be Mickey? I think it's Liza "with a z" Minnelli! LOL! Way too funny! Especially love the 'Snot Mickey'. The first one looks like Jay Leno. I just saw this post and I legit LMAO by the end of it. Absolutely hilarious!